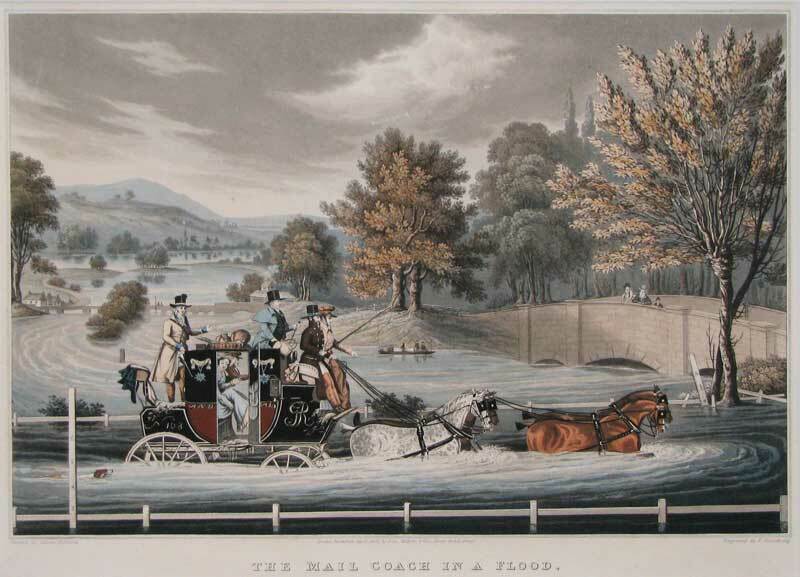 This evocative print shows the mail coach caught in a severe flood with the flood waters up to the haunches of the four horses and a measuring stick showing the height to be two and a half feet. A dog swims along behind the coach and the two travellers inside raise their feet to avoid getting wet. With flooding a common occurrence in twenty first century England it is fascinating to see this scene from 1827 showing the countryside disappearing under water. Frederick Rosenberg was, unusually for engravers, known only for one subject; he concentrated upon coaching subjects and, as you can see, to great effect. James Pollard (1797-1867) was born in Islington, north London, the son of the artist and engraver, Robert Pollard. Like his father before him, he spent his working life in London painting and engraving sporting subjects. He learnt his trade from his father and between them they have become synonymous with the sporting art that came to be so popular from the late Georgian to the mid Victorian period. Few homes would be complete without a coaching scene or an equestrian study by one of the Pollards and they have remained fashionable to this day.